The O'Connell Bridge in Dublin, Ireland, at night. Enchanting and inviting, the port of Dublin will leave an indelible mark in your travel journal—and in your heart. It’s rich in Celtic heritage and lively craic (Gaelic for good times), and holds endless stories and secrets along its cobbled streets. To make the most of your time in Dublin, we’ve put together two 36-hour itineraries: one that takes you to the best parts of the city, plus a few hidden gems, and another for travelers who’ve been before and want to experience the city from a new perspective. Get your bearings and get a feel for the city on a tour along the River Liffey. Spilling down from the Wicklow Mountains and cutting through the center of the city, life in Dublin revolves around the river. Stroll along the scenic Bachelors Walk on the north side and then board a covered boat that brings amazing views, even if the weather isn’t quite cooperating. Discover Dublin’s famous bridges like the arched O’Connell Bridge, the white wrought iron Ha’penny Bridge, and the harp-inspired Samuel Beckett Bridge. You’ll also sail by an effortless blend of historic buildings and modern architecture. From the imposing 18th century Custom House to the sleek steel facades of the Docklands, it’s easy to see that Dublin embraces the past while looking confidently toward the future. After your morning tour, grab a bite and a pint at O’Connells. Its vaulted ceilings echo the nearby bridge, its menu is hearty and authentic, and its patrons are always happy to chat and share their favorite things to do and see in Dublin. After lunch, it’s off to EPIC The Irish Emigration Museum for a uniquely interactive experience. The world’s only fully digital museum explores 1,500 years of Irish history and tells compelling stories of the 10 million Irish emigrants that left the island in search of new adventures and bright futures. Want to trace your Irish roots? Genealogists are on hand to help you take a look into your family’s past on the Emerald Isle. It’s tradition to take in Temple Bar on a day out in Dublin. Considered the cultural heart of the city, head across the Sean O’Casey Bridge from the museum and up a few blocks (a twenty-minute walk) along the Liffey’s south bank to a neighborhood packed with pubs, cafés, galleries, and shops. Get lost in little laneways, then let the sounds of a “trad session” (authentic Irish music) bring you back to Meeting House Square, where an open-air stage often hosts live performances and film screenings. Before you go bar hopping, fuel up at BóBós Burgers, where local beef and Dubliner cheese get the gourmet treatment. For an elevated experience, dine at Cleaver East in the Clarence Hotel, and keep your eyes peeled for its famous owners—Bono and The Edge of mega-band U2. If the Temple Bar seems a little too busy, don’t despair. For a pint of Guinness (we swear they really taste better in Ireland) visit the iconic Auld Dubliner or the flower-laden Palace Bar. If you want to expand your hoppy horizons, The Porterhouse serves up their own amazing microbrews, plus bottled selections from around the world. After your evening of revelry, dig into a “Full Irish” breakfast to start your second day in Dublin. The saying goes “eat breakfast like a king, lunch like a prince and dine like a pauper”, and this traditional meal certainly fits the bill. Consisting of bacon, sausages, white pudding (sausage with oatmeal), eggs, mushrooms, tomatoes, baked beans, and potatoes plus Irish soda bread, jam, juice, and tea, you’ll have all the energy you need for a day of exploring. Dublin has long been home to literary luminaries, with its enchanting atmosphere inspiring the works of James Joyce, Oscar Wilde, and many more. At the edge of Merrion Square, adorned with stylish Georgian architecture, you’ll find Oscar Wilde’s house and a languid statue of the witty writer lounging within the square. Two free museums are close by, each well worth a visit. The National Gallery houses extensive collections of Irish and European paintings and sculpture, and the National Museum displays archaeological wonders unearthed from prehistoric Ireland and the Viking Age. A short walk up Kildare Street from the National Museum takes you to the lush paradise of Saint Stephen’s Green. This traditional Victorian garden covers 22 acres with winding footpaths, brilliant flowerbeds, tranquil lakes, and impressive rock features. At the opposite corner of the park at the top of Grafton Street, the airy, glass-ceilinged Saint Stephen’s Green is a popular spot to do some shopping and grab a bite to eat before your final—and iconic—Dublin adventure. You can’t end your first visit to Dublin without a visit to the famous Guinness Storehouse! It’s about a 30-minute walk from the green, so a short taxi ride or quick tour on the hop-on-hop-off bus will get you there quickly. Even if you’re not a beer fan, this museum, brewery, and bar serves up an immersive experience that sheds light on the world-renowned brewer, and its impact on the culture and identity of Ireland. Starting on the ground floor, you’ll find the famous lease for the property embedded in glass on the floor. In 1759, Arthur Guinness signed a 9,000-year lease for £45 per year. It’s safe to say this place will be around for a while! Moving up the pint glass-shaped building, you’ll learn about the brewing process, the company’s iconic advertising campaigns, and even learn how to pour the perfect pint of silky stout for yourself. On the fifth floor, a traditional dining hall offers up a menu that incorporates Guinness in most menu items. At the top, you’ll be treated to 360-degree views of the city and surrounding countryside at the Gravity Bar. Etchings on the floor-to-ceiling windows give unique insight into the skyline before you, including surrounding neighborhoods and the Wicklow Mountains. For your last few hours in Dublin, make your way back downtown to Grafton Street, a pedestrian street that comes alive as the sun goes down. Lined with street performers and vendors, you’ll find a more varied selection of bars, restaurants, and nightclubs than in Temple Bar. Sip one final pint or cocktail and enjoy the lively, magical city. Coming back to Dublin is like visiting an old friend. No matter how much time has passed, it’s easy to pick up where you left off. There are likely some favorite spots you’d love to revisit, but for a new itinerary that takes you away from the most visited Dublin attractions, we’ve got a few suggestions. It’s time to take a step back in time and explore Dublin’s medieval history. Start at Dublin’s oldest building—Christ Church Cathedral founded in 1030. Easy to spot by its arched stone pedway, the church boasts intricate tile work, an enormous crypt, ancient artifacts, and a collection of original 16th costumes featured in the acclaimed historical series “The Tudors”. Across the street, Dublinia lets you live life in Dublin during the Viking Age. Try on Viking clothes, step on board a warship, wander through a medieval fair, and take the stairs to the top of St. Michael’s Tower for sweeping city views. Take some time before lunch to explore Dubh Linn Gardens, the area that gave the city its name. Located on the site of the original dubh linn (black pool) where Viking settlers anchored their ships, discover Celtic spirals in the four seasons garden, and wander through the four corner gardens—each with their own themes highlighting more modern aspects of the city’s history. You can’t leave this part of the city without visiting the Chester Beatty Museum. Touted as being one of the best museums in Europe, explore the impressive collection of ancient manuscripts, paintings, religious texts, and costumes from every corner of the world collected by Irish Mining engineer Chester Beatty. Escape the bustle of the city at the serene Japanese rooftop garden, and enjoy a light lunch of Middle Eastern fare at the museum’s Silk Road Café. For even more dining options, head around the corner down South Great George’s Street to the stalwart of Dublin shopping at George’s Street Arcade. The city’s first purpose-built shopping center, this jewel of Victorian architecture is where old Dublin meets trendy boutiques, unique local shops and chic department stores. Stroll around under vaulted glass ceilings to find a special keepsake, then, it’s time for a nightcap. The Shelbourne Hotel is the place to see and be seen in Dublin. Take a ten-minute walk along St. Stephen’s Green to the corner of Merrion Row and Kildare Street to enjoy an evening cocktail at the city’s most iconic hotel. Featured in James Joyce’s Ulysses, and the site where Ireland’s constitution was drafted in 1922, you can sense its storied past as soon as you walk in. Drain a dram of whiskey at the Horseshoe Bar, or sip an inventive cocktail at No. 27 Bar & Lounge. Now that you’ve explored the more ancient side of Dublin, take a step towards the modern era with a visit to the Dublin Writer’s Museum, then a take a tour to hear what some of the city’s most famous residents have to say. Housed in an ornate mansion on the north side of the River Liffey, the Writer’s Museum gives you a deeper appreciation for the works and lives of Ireland’s most celebrated literary figures including James Joyce, George Bernard Shaw, William Butler Yeats, and Patrick Pearse. Get your smartphone out for Dublin’s interactive Talking Statues tour. Ten famous statues around the city have been imbued with the gift of gab, thanks to modern technology. Scan the code at each statue and you’ll receive a call from the likes of Joyce, Shaw, and even Molly Malone! With monologues written and voiced by contemporary Irish writers, scientists, and celebrities, it’s a fun way learn more about the city and its famous residents while wandering around the city on your own terms. Now that you’re back on the south side of the river, get a bite to eat then make your way to the Irish Whiskey Museum. Unlike the obvious Jameson Distillery tour, tasting tours at the museum give you the chance to learn about whiskey culture in Ireland and serve up to four whiskey samples from different distilleries. If you’ve still got some time on your hands, take a walk through the grounds of nearby Trinity College, lines for tours and viewing the Book of Kells are long, but a stroll on your own is well worth it if you haven’t been before. After two days of exploring beyond the surface of Dublin. Relax for the evening at a hidden gem often overlooked by visitors but loved by locals. House Dublin might look like any other Georgian townhouse from the street but step inside for an upscale dining experience. Both relaxed and glamorous, each room offers its own special atmosphere, especially the airy Garden room with its olive and citrus trees. 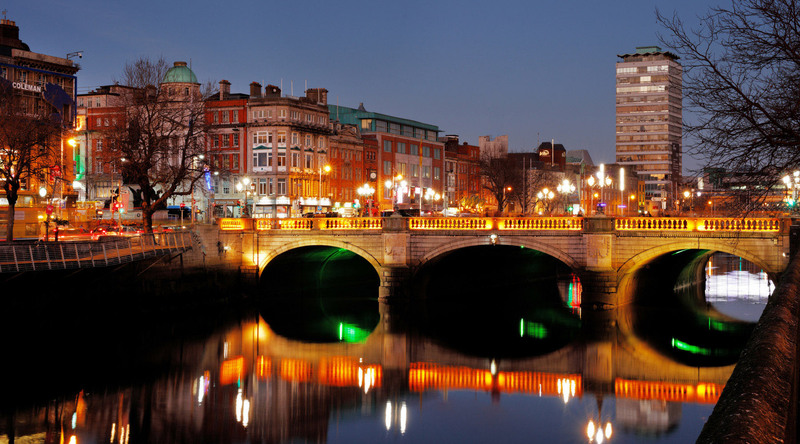 With two great itineraries to choose from, Dublin is yours to discover! Check out these upcoming cruises to Ireland and beyond that call on this enchanting city.